The next big summer make-up launch has arrived! 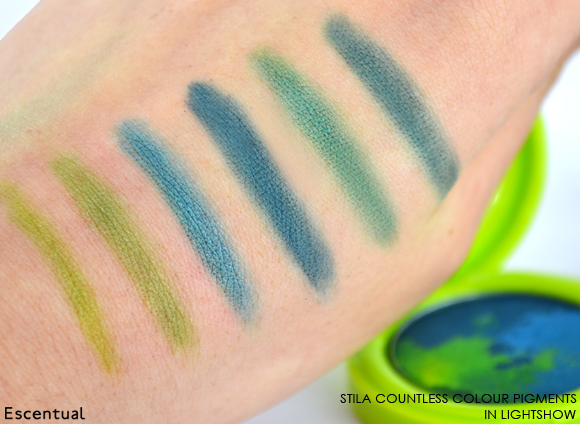 The Stila Festival of Colour Summer Collection is an exciting fusion of pigmentation and innovation that encourages you to have a little fun with your make-up. 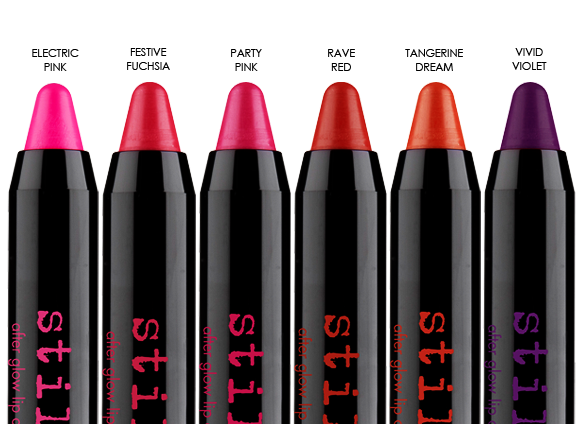 Inspired by the electric atmosphere of music festivals, each product is packed with vibrant pigment and is very long-wearing. The collection includes two shades of the Stila Stay All Day 10 in 1 HD Beauty Balm, two new Turquoise shades in the Smudge Stick Waterproof Eye Liner and the Stay All Day Waterproof Liquid Eye Liner, and two limited edition star products that I’ve taken a closer look at: the Stila Countless Colour Pigments, and the Stila After Glow Lip Pen. Though I’m not a big wearer of eyeshadow, I actually think the Countless Colour Pigment is one of my favourite launches of this year so far. It’s genius. 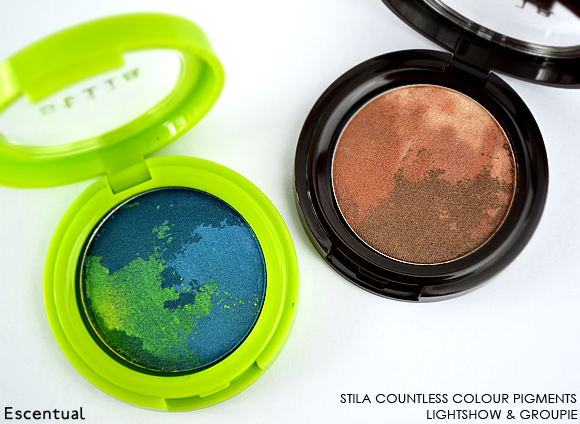 Each one blends three colours of baked powder together in a tie-dye effect, so you can use the three colours separately, blend two together, or sweep all three across the lid in a sort of ombre effect. 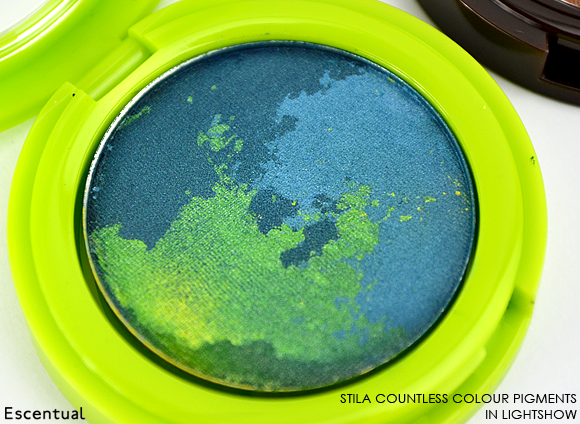 The idea isn’t completely new, but Stila’s expert touch turns what could be quite a novelty into a seriously impressive little pot of colour. For example, the pattern carries through to the bottom of the pan, so you don’t have to worry about the colours merging. If you’ve swirled all of the colours together and you’re left with a multi-coloured mess, simple dust away the top layer and the pattern is as good as new. A little tip, though – don’t wet your brush and dip it into the colour. It’ll emulsify and then congeal, ruining the pattern. How much does Lightshow remind you of the Aurora Borealis? It’s so beautiful. Made up of three separate shades of green, azure blue and navy, it’s perhaps the most colourful offering of the five available Countless Colour Pigments. From chartreuse right through to deep blue, I was able to create lots of different variations of blue and green – and I could have made more! There’s a little splash of yellow in the green that is great for creating light greens and turquoises, which I love. 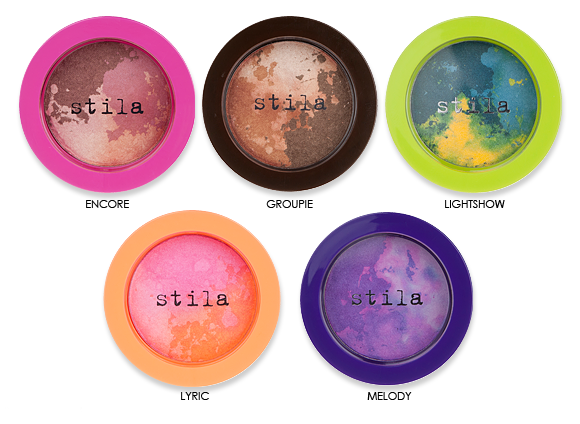 Like all of the shades, it has a pearlescent, satiny finish which offsets the uber-brightness of the pigment nicely. Groupie’s swirl of browns is a dream for lovers of muted tones – it’s an entire spectrum of neutrals in one little pot. You can create any shade from light beige through to the dark brown, all you have to do is take a little bit of pigment from different places around the pan. It’s great fun. Here are some of the shades that I was able to make. You can see that once again the pigment has a beautiful pearlescent sheen that appears more metallic as you build it up. It’s a shame these are limited edition; I can see them being incredibly popular as a makeup bag-friendly alternative to lugging a whole eyeshadow palette around! The best thing about this product is that is offers the best of both worlds, and performs each side of its personality very well. During the day it has great colour pay-off. It’s long-wearing and comfortable, with a formula that boasts a wealth of moisturising ingredients including sunflower seed oil, algae extract, glycerin and oat kernel extract. After dark, under UV light, the colour glows in the dark with a surprising intensity. 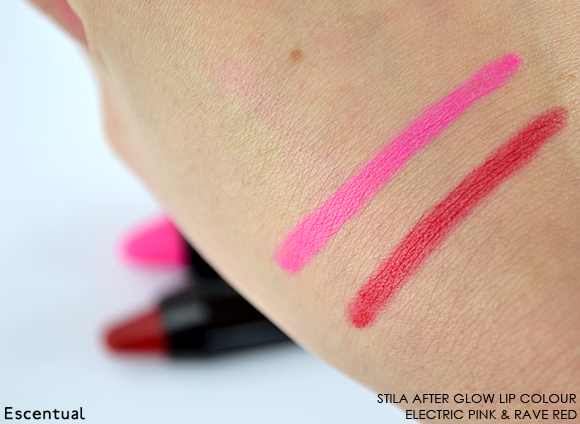 The packaging of the After Glow Lip Colour is reminiscent of Clinique’s Chubby Sticks and Dior’s Jelly Lip Pens, with the same twist-up mechanism to release more product when it nib runs down. It’s a really handy way to apply, store and carry around your lip colour, especially during holiday season. 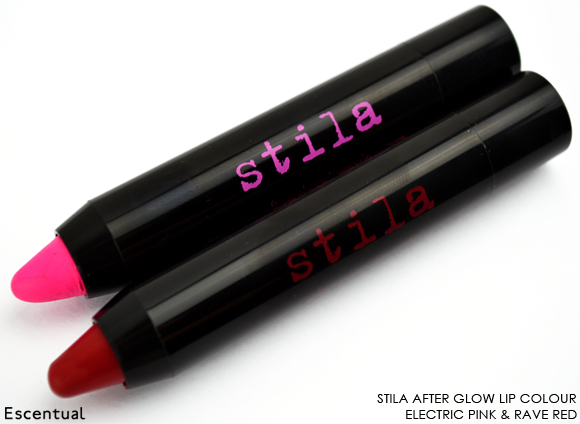 Here we have two of my favourite shades: Electric Pink, a cool neon pink, and Rave Red, a rich and true red. The pigmentation of both colours is brilliant, thought Electric Pink is slightly more matte and pigmented. A great thing about the shades is, even after the creamy colour has worn away, some of the pigment remains for a subtle ‘bitten’ effect stain. 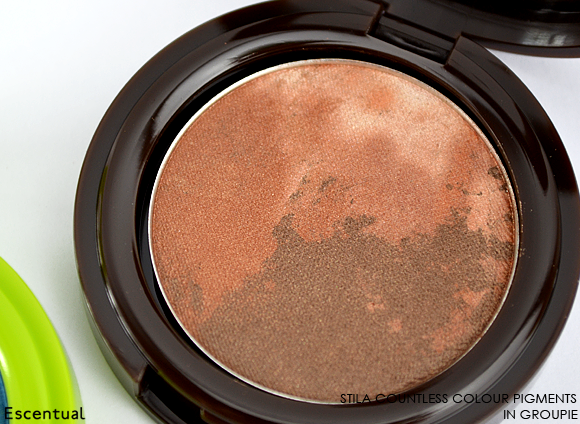 I love this – it’ll be great during summer when colour seems to wear away more quickly. Are any of the products catching your eye? Do you wish they were a permanent addition to the range as much as I do? 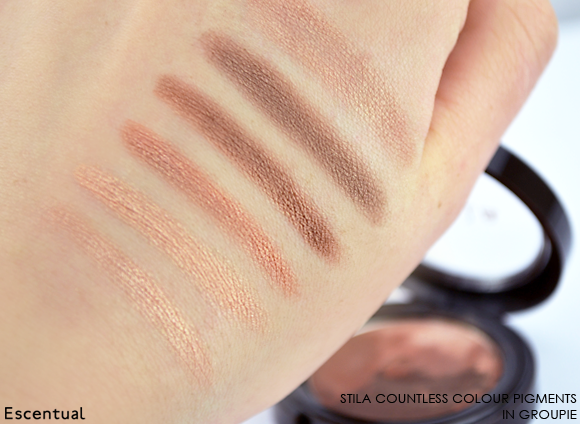 This entry was posted on Tuesday, May 21st, 2013 at 10:18 am and is filed under Make-up, Swatches, Trends, Tried & Tested. You can follow any responses to this entry through the RSS 2.0 feed. You can skip to the end and leave a response. Pinging is currently not allowed.